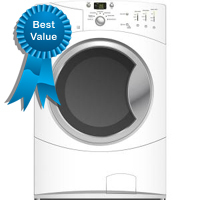 Need Best Washing Machines and Top Washer Picks Recommendations by Price Range? When purchasing a washer, you want the Best possible quality & features for the lowest possible price. We've done the research and have come up with the following Top Washers representing high quality machines that give you more for your money. should be a go-to pick for anyone wanting a hiqh quality front loading washer at an incredible price point. This is a great alternative to traditional top load washers at a similar price. #1) Huge Capacity: With more expensive front loading washers costing hundreds more the GE GFWN1100LWW Washer, with 4.0 Cu. Ft. of capacity offers large capacity at bargain prices. You won't have any issue washing king sized comforter in this unit. #2) Great User Reviews: Leave it to the user base to be the best indicator on performance. User rave about the washing machine's capacity, consistant cleaning performance, ease of use and quiet operation. #4) Quiet Operation: General Electric went to great lengths to keep the GE 4.0 IEC Cu. Ft. King-Size Capacity Washer ultra quiet by design their Trademarked Quiet-By-Design insulating system to help dampen noise and vibration. Suitable for 2nd story installations. #5) Fast: Quick wash cycles for lightly soiled clothing can run in under 20 minutes. Fast spin speeds (1000 RPM+) help wring extra moisture out of clothing, reducing dry times. #6) Simple User Interface: The GE GFWN1100LWW's user interface is easy to learn. Expect quick ramp times from even the least tech savvy users. If you're looking for the Washer that gives you the most for your money at this price point, you just can't beat the GE 4.0 IEC Cu. Ft. King-Size Capacity Washer. You get larger load capacity, more quiet operation, more cycles and one of the best warranties in the industry. Rated #1 on Sears.com, the Kenmore 4.0 Cu. Ft. Front-Load Washing Machine (4027) Energy STAR washer receives incredible user reviews. Even a Leading Consumer Magazine's have given this Kenmore washer rave reviews. #1) Cleans Very Well: At the end of the day, all the bells and whistles don't mean a thing if your washer does'nt clean well. No need to worry here because the Kenmore 4027 gets Excellent reviews here. Most users note the Sanitize feature which can get even the most soiled cloth diapers clean as new. #2) Large Capacity: 4.0 Cu. Ft is plenty big for King Size comforters and large family load requirments. #3) Highly Efficient: ENERGY STAR ratings clock the Kenmore 4027 washer in at an estimated 126 kWh/yr making it highly competiitve with other washers in its class. Expect lower annual operating costs, especially if upgrading from traditional top load washer models. Many users note using less detergent due to the machines operational efficiency. #4) Excellent User Reviews: User's note quiet operation, consistatn cleaning, high spin speeds among the Kenmore 4027's best attributes. A couple of standout features justify a purchase including ENERGY STAR CEE Tier 3 rating, NSF Certified Sanatize Cycle which is great for families, Smart Wash Technology including Tumbling, Rolling, Scrubbing, Stepping to effectively remove dirt and debris. Accolades abound make this a safe buy if within your budget. Everywhere you look, the LG Electronics 4.2 Cu. Ft. 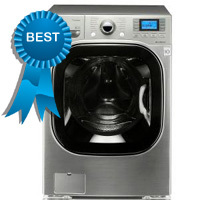 Extra Large Capacity SteamWasher is receiving top ratings for value, perfromance and features under $1,000. 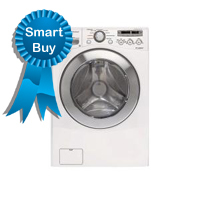 #1) Reliable: LG Washer are some of the most reliable washers on the market. This is especially impressive given LG's history of leading the marketplace in new washer technology. The WM2501HWA's direct drive, NO-Belt, drive system minimizes washer failures. #2) Huge Capacity: The WM2501HWA's 4.2 Cu. Ft. of capacity make it one of the largest front loading washers on the market. King Size comforters and large family laundry requirments will be no problem. #4) Quiet Operation: LG's created the TrueBalance Anti-Vibration system to minimize washer vibration for smooth, quiet performance. This coupled with the direct drive system helps make the LG WM2501HWA a very quiet operator. You're not missing anything with the LG WM2501HWA washer. Standout features include a huge capacity drum, steam washing, quiet operation and LG reliability. If you're looking for SteamWashing under $1,000, you can't beat the LG WM2501HWA washer. For those looking for the Best of the Best, look no further than the LG 4.8 Cu. Ft. Ultra Capacity Front Loading SteamWasher. That's right 4.8 Cubic Feet capacity. #1) HUGE Capacity: At 4.8 Cu. Ft. capacity, this is one fo the largest front loaders on the market. Larger tubs equate to fewer loads helping reduce time spent washing and money spent on electric bills. #2) Features Galore: When we say this washer has it all, we're not kidding. LG's Coldwash option allows you to clean clothing with cold water to save on energy costs. Special 6 motion technology works harder to knock dirt out of clothing while remaining extremely gentle on fabric. Many wash cycles and cleaning options including unique 20 minute SteamFresh cycle. #3) Steam Cleaning: LG's Steam Technology deeply penetrates fabrics to knock out dirt, while reducing wrinkles and odors, it also uses less water than traditional washers, so you won't take a bath on your bills. 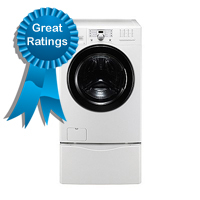 #4) Reliable: LG washer are some of the most reliable on the market. Direct Drive Motor 10 Year Warranty. When you buy a washer, you don't want to worry that it won't last - Because the Direct Drive Motor uses less moving parts and operates more efficiently, LG confidently offers a 10-year warranty. This washer has it all and will exceed anyones expecations. You'll love it from the moment you first lay your hands on the LG WM3875HVCA's intuitive LCD Display. If you have the budget, buy with confidence.